What do you do when worship is not up to your expectations? Songs prove uninspiring, preaching lacks application for you, and maybe you just feel unwelcome for some reason. May I suggest a strong dose of thankfulness? You probably do not need to look very far to find it, and it can turn your spirit toward worship mighty quick. Happened to me the other night while checking email at home. What does more to boost your own sense of happiness? Pleasure or Gratitude? I knew my answer right off, but didn’t click the response just yet. Instead I just mused on the question. I will spare you the details of what all crossed my mind on the pleasure side of the equation, but as I contemplated gratitude it triggered a 30-minute reflection that morphed from remembrance to heart-filled worship. First thing I knew my eyes grew misty, and then the tears started to flow as I thought about people, places, and things that have meant so much over the course of my life. Gratitude fostered remembrance of so much grace. I started out thinking how grateful I am for family, immediate and extended. Then there was the spinoff considerations of how we have been blessed by church family when needs have so often been met in all sorts of circumstances. I thought of how much wise council I have gotten from pastors, deacons, and friends at just the right times. So many directions for this thinking to go, it is almost endless because everything for which I am thankful brings to mind people, places, things that unleash another flurry of reasons for unbridled gratitude. Even thoughts of times when finances were stark, or when health scares had us on our knees brought waves of thankfulness as I recalled all the ways God provided and faith was strengthened. Of course reflection of this nature brings to mind loved ones who have been so much a part of life’s journey who are now separated from us by death. Again, another wave of heart-stuffing thankfulness to know we will see them again. When I looked back at the computer screen to try and finish the quiz I went back to thinking about pleasures to remake my comparison. That brought to mind how every pleasure, from planning and enjoying our first ever cruise to the smell of bacon and coffee on a Saturday morning to the running embrace of a grandchild to the telling of funny stories at bedtime to those same grandkids and the sound of their incessant giggling. It struck me that even in recalling the pleasures I was basking in gratitude. My answer would be correct. My answer was Gratitude. Click. Yep! The screen said my answer was right. And so right it was and is. In this month of November, when a day of thanksgiving is officially scheduled, for which I am grateful by the way, I am reminded that for Christian worshipers thanksgiving should be a basic condition of life. It is certainly a prerequisite spirit for worship. The Apostle Paul is especially instructive about this attitude which I believe to be foundational to a true worshiper’s heart condition. Paul reflects the attitude as he thinks of his brothers and sisters in Christ, as he considers all that God has done, and as he considers how he wants to lead those under his influence. Worshipers in the Old Testament were admonished toward a grateful disposition as well. Their worship songbook was loaded with exhortation to praise in a spirit of thankfulness, and the prophets kept them looking toward everlasting thanks. I may not be happy all the days of my life, but by God’s grace I pray to be ever thankful, and one day to enter heaven’s gates as a worshiper full of gratitude for His unmerited favor! The order of worship in a church service never saved anybody. It is quite possible, however, for the worship order to reflect the shape of the very Gospel that it purports to proclaim, the Gospel that changes everything. It makes sense to me to reflect and embody the Gospel in every way possible in our worship, including the way we order components, and guide worshipers along in a conversation with our loving, saving Lord. One of the roles of worship leadership is to remind worshipers where we are in that conversation of worship. Let’s face it. This worship thing is strained enough as it is. After all, we are seeking to engage in spiritual connection/communion with a Three-in-One being we cannot see, and do so by faith guided by a book we may struggle to understand or believe. What’s more, we are trying to embrace this engagement together as a corporate body united. Impossible. And yet it happens. As with salvation itself, the engagement is only possible by grace that He gives through faith that He gives (Ephesians 2:8). It would seem important that we participate in routines such as we see represented in biblical patterns of worship. Like it or not there is a routine to worship. 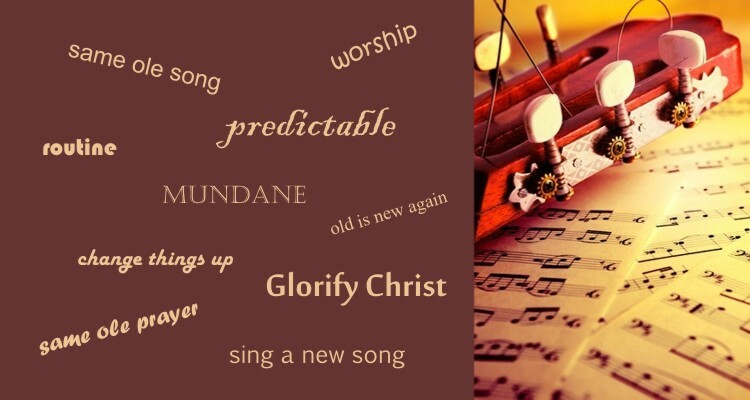 I realize that many churches describe their worship with words like fresh, new, exciting, transformative, and the like. I think those expressions are generally just market-speak, but hope they imply an underlying desire by leadership for people to come to know a new, exciting, transformative life in Christ. Christian worship involves certain elements, certain actions. We may mix them up, scramble them around, leave some out then add them back later, move some from live to video, or from aural to visual, from written to spoken, from spoken to sung, etc. Regardless, the elements of worship are the elements of worship. Newness that will make a true difference in one life or in a corporate body, or in the community around us is not our construct, but a grace gift of the Holy Spirit. There are components of Christian worship that have been practiced since the earliest gatherings. They serve a purpose. Along with this liturgy-lite approach, many churches no longer bother with printed order. Under the banner of a “less is more” philosophy, or “since they don’t see it in writing we can surprise them” approach, the gathered are purposefully (and sometimes literally) left in the dark. Given the consistency of our routine practices, printing or not printing likely has little impact regardless, unless the leaders were to consciously communicate through what is printed as order. To be blunt, I find settings that pride themselves in innovation to be some of the most predictable environments of all. And there are lots of them. The question I would join others in posing is, “what have we given up by abbreviating the traditional worship order?” What I am speaking of by “traditional” is what Kein DeYoung refers to as the “traditional Protestant order of worship…..what churches use to do when they didn’t know what else to do.” I am talking about an approach that engages worshipers in the rhythm of worship, God’s revelation and our response, and in an orderly manner that participates in the shape of the Gospel itself. For those who fear drifting back into long orations by humdrum voices, your innovation can surely be applied remaining faithful to the Gospel shape. Worship acts such as call to worship, praise, invocation, confession, illumination, petition and intercession, passing of the peace, communion or invitation response, sending and benediction can be said, prayed, or sung. We must exercise great care, however, as to what is left on the cutting room floor. By eliminating scripture readings, prayers, acts of fellowship, frequent observance of ordinances, and other sacred acts, I fear we have fostered drive-by worshipers looking to get the worship thing in before returning to other business in “real life.” Checking worship off the to do list is a far cry from the kind of “take up your cross and follow me” sacrificial living intended as Jesus worshipers reflect the light of the risen Savior Who gave all for His Bride, the worshiping Church. Kevin DeYoung Is the New Evangelical Liturgy Really an Improvement?